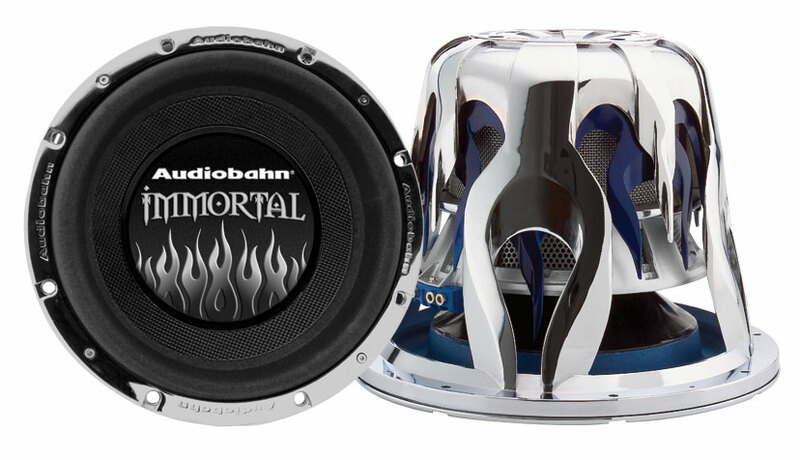 Designed specifically for the competition environment, Audiobahn presents the IMMORTAL Series subwoofers. Their quad 2 ohm voice coils can handle up to 2250 watts of continuous power. They feature design elements like 200oz. triple-stacked Strontium magnets, proprietary tall excursion foam surrounds, and 25mm top plates, all ensuring maximum cone excursion and subwoofer efficiency. The Audiobahn IMMORTAL series subwoofers packages these advanced qualities into an ultradurable, cosmetically-appealing, chromed 3-dimensional die cast aluminum basket. CONE: The ultra-light 2-layer laminated carbon fiber Kevlar cone features an aluminum dustcap, making the cone rigid as well as lightweight. This design allows the cone to travel more easily with the same amount of power. More pressure and more sound can be created because less power is wasted controlling a heavy cone. Since this is an SPL competition subwoofer, high efficiency is crucial. BACK-PLATE: This woofer features a bumped back-plate, which allows the cone to travel further, increasing excursion. Increased excursion means increased air displacement leading to increased sound pressure levels. Proprietary Tall Excursion foam surround: allows for maximum excursion 14/15 and maximum cone surface area. Hole Cut Out 10 7/8"